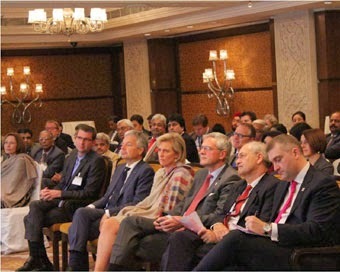 Visit Flanders and VISITBRUSSELS organized a tourism seminar on “World War I Remembrance 2014-2018” at The Taj Palace, New Delhi. lead by Princess Astrid, representative of His Majesty the King of Belgium. The Princess is accompanied by H.E Mr. Didier Reynders, Deputy Prime Minister and Federal Minister of Foreign Affairs, Foreign Trade and European Affairs, and H.E Mr. Kris Peeters, Minister-President of the Government of Flanders, Flemish Minister for Economy, Foreign Policy, Agriculture and Rural Policy. The seminar included presentations on plans for the Great War Centenary 2014-2018 – a four-year remembrance project set up by the Government of Flanders. During World War I, Around 72,000 Indian soldiers fought in Flanders as members of the British army (Indian Army Corps). 7000 of them lost their lives. At the Menin Gate in Ieper, similar to the India Gate in Delhi, a dedicated monument has been erected in their honour. The First World War commemorations in Brussels-Capital Region reflect the city’s current national and international status. They are an opportunity to underline the timeless and universal nature of values such as memory, freedom, solidarity and social cohesion. As a result, they will take a broad view and not focus solely on the conflict experienced in Brussels. Over the last few years preparations have been on in Flanders & Brussels for the commemoration ceremonies that begin in 2014 and will continue over the next four years. Visit Flanders is expecting at least two million extra visitors to the sites and cultural events in remembrance of the Great War in the coming years. The In Flanders Fields Museum in Ypres has been refurbished and enlarged, and is now home to a WW I knowledge center. More than 500 original objects and documents are on display and visitors can discover four personal stories through interactive kiosks in this state of the art museum. Other important sites are the Lijssenthoek Military Cemetery visitor center, the Talbot House, the Memorial Museum Passchendaele 1917 and the Goose Foot Complex in Nieuwpoort.